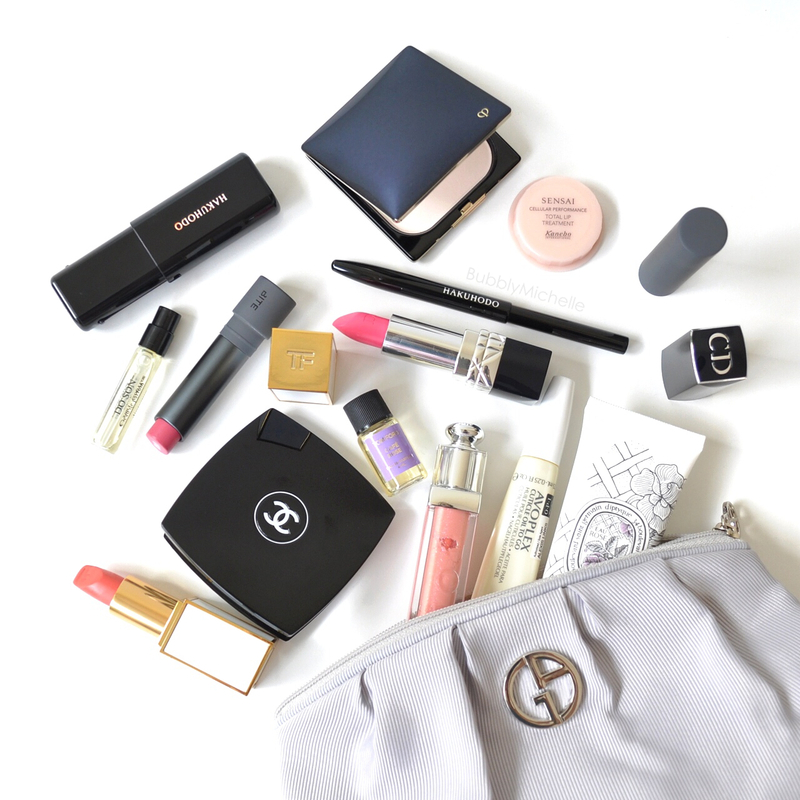 So today we talk about the utterly boring contents of my makeup bag. Cuticle oil, lip balm, mirrors.. the works! I have been meaning to do a detailed write up for a while now, but with so many new things to blog about, posts like this get postponed. In any case, I am glad I finally got around to it. So here’s a group shot of everything that’s slowly accumulated over the week. I keep all of my stuff in this good sized lightweight Armani pouch which was a gift with purchase. It’s roomy enough to fit a lot of stuff, and I like that the pouch is somewhat padded so my precious makeup stay safe n sound! Moving on to the actual contents. 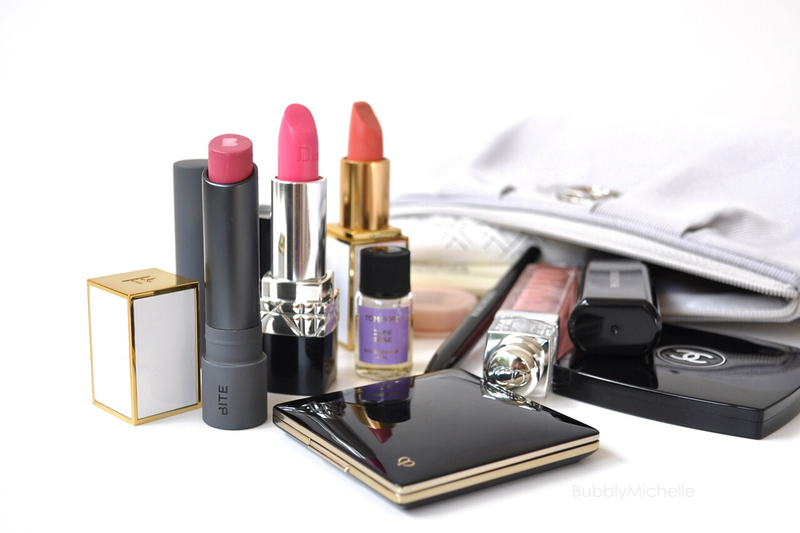 First up, lipsticks! Next up, a new addition to my bag! A generous gift from Clé de Peau. The Refining Pressed Powder LX. So far I have only used this once as I am quite lazy to do any touch ups mid day but I do see myself getting a lot of use off this at dinners and parties where I do touch up any shiny areas without hesitation. 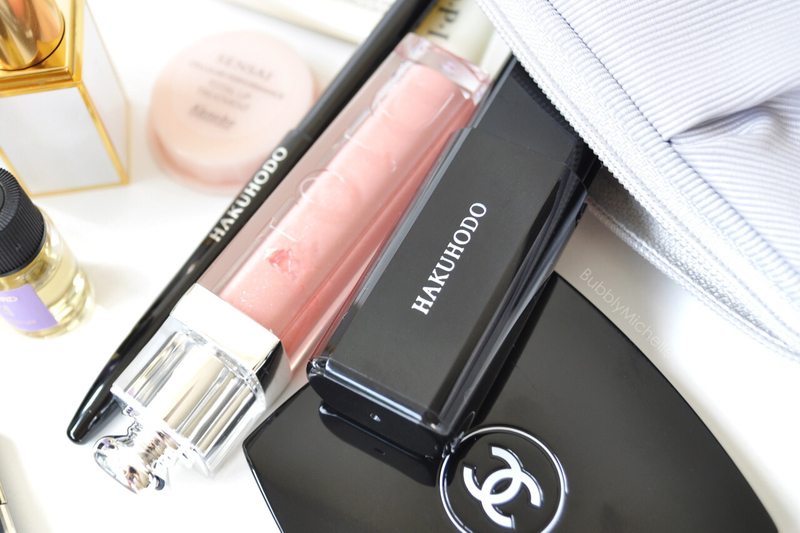 The super slim and compact size makes it ideal for tucking into tiny evening bags and it really is the slimmest powder compact I have ever seen! even in my tiny hands, this still looks so small. Astounding! Next come my essential hand and nail care products. I love taking care of my hands. My fail safe goodies are a good hand cream and cuticle oil, they keep my hands hydrated and well groomed at all times. The Avoplex cuticle oil is one of my HG products. I think I am on my 3rd tube of these. I use this for an instant boost of hydration if I notice any dry, scaly cuticles. What I love is that the brush tip makes for easy application and the cap screws on tight so there’s no danger of leakage. One of the most user friendly cuticle products I’ve found. I also like to keep a few perfume samples for those days when I rush out forgetting to spray on some perfume. 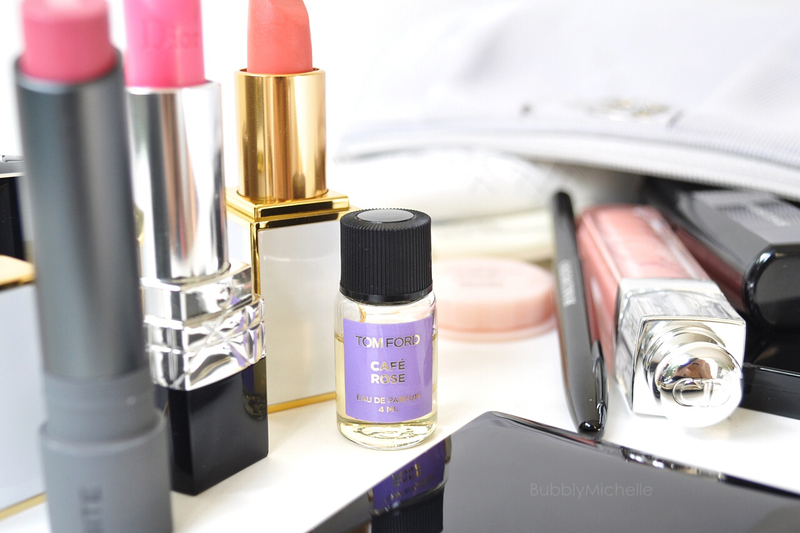 These day’s I carry my trusty Tom Ford Cafe Rose perfume and Diptyques Do Son. Both very unusual and uncommon fragrances. Next up are more ‘residents’. 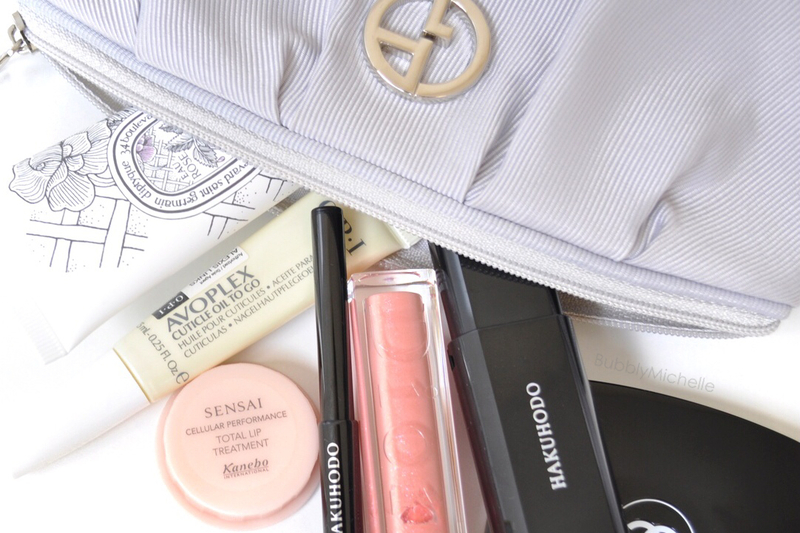 Lastly, I keep my trusty Sensai Cellular lip treatment in my bag at all times. It’s a sample size which makes it perfect for a makeup bag and I love the light texture of this. I only need a very little to sooth dry lips. P.S- This also happens to be the same lip balm I use in my nigh time skin care routine. So that’s the the round up of products that I call essentials. What are yours? Do you carry anything else apart from what’s listed here? If so please share 🙂 I’d love to know! the refining powder looks to die for! I just love your photos Michelle!! Courtisane is such a beautiful lipstick and I just picked up Sweet Spot. 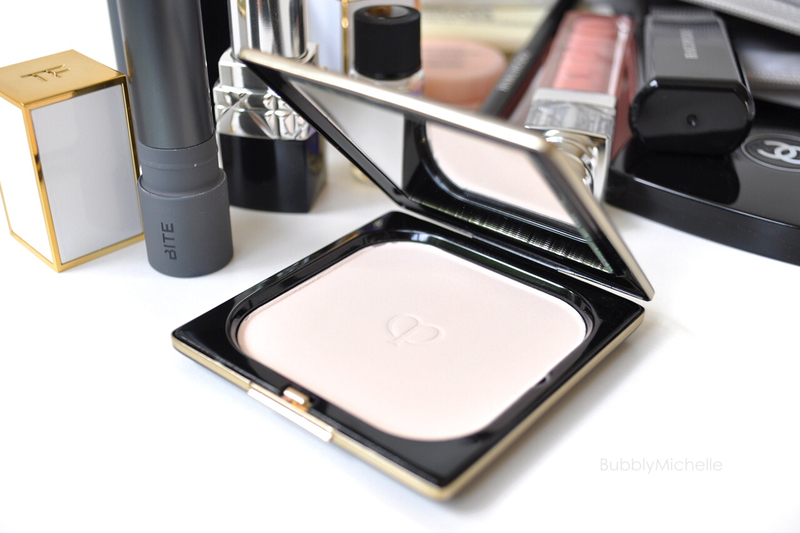 Love the packaging on the Cle de peau powder-I dont own anything from them (yet)! Thank you so much Fanny 🙂 You are the sweetest! I’m curious about that Cle de Peau powder. It’s so slim! I am silent reader. Can I check if your haku j601 (retractable brush) shut tightly? I just purchased mine yesterday, I found tht my brush cover can slide open loose when in shut position.. not those tightly closed..wonder if mine is faulty. >.< I know… I was dying to get it myself.. it's heavenly..